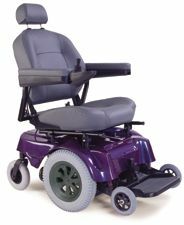 This very versatile pediatric electric wheelchair will give young patient the mobility they need and provide safety and durability for everyday use. The durable power system and programmable joystick controller offer unsurpassed performance for children or smaller adults. Premium high tech motor provides stable power and low electricity consumption. Easy folding chrome plated frame. Height adjustable , detachable armrests. Fast charging 5 amp automatic charger. Padded double embossed upholstery, padded arms and calf pads. Seat belt included. Front riggings Adjustable from 9" to 11"
8" x 2" cast aluminum caster wheels with air foam tires. 20" x 2 1/8" cast aluminum rear wheels with pneumatic tires and puncture resistant tubes. Anti tippers and cam action, swing away footrests with roller bumpers and heel loops. Integrated programmable controller with energy efficient right angle gear motor. Weight Capacity - 220 lbs.